The Golden State Mortgage family would like to wish you and yours a very happy holiday season. Want a break from the cramped big city holiday rush? The village of Mendocino has what you’re looking for. There are no franchised chains in the entire village. Each shop and restaurant offers something special. Many of the glistening, decorated historic buildings are filled with local crafts and art. Just north of town, the Mendocino Coast Botanical Gardens during its Festival of Lights, bursts to life on weekends with music and lighted displays, with everything from sailing ships to jellyfish. In Fort Bragg, roughly fifteen minutes north of town, board the Skunk Train for an exclusive holiday sightseeing ride through the redwoods that includes hot cocoa and strolling musicians. 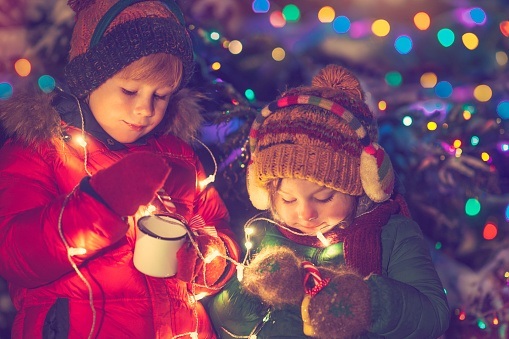 Experience Christmas past during this historic town’s Victorian-style celebration. The event is like a Charles Dickens novel to life, and as close to the real thing as you can get. The town’s narrow, hilly streets, lit by glowing gas lamps set against a backdrop of towering pines, make you lose all sense of time. Carolers in period dress, brass bands, and bagpipers fill the streets, where the award-winning holiday movie The Christmas Card was filmed. The aromas of roasted chestnuts and hearty holiday foods fill the air. You’ll be drawn in with cries of street vendors hawking their wares and lamp-lit streets filled to overflowing with authentic Christmas treasures, such as hand-crafted candy, jewelry, pottery, perfume, dolls. This annual occasion takes place two Wednesday evenings and three Sunday afternoons in December. For another memorable Gold Country experience, drive to Grass Valley, less than ten minutes away, where the Cornish Christmas Celebration commemorates the town’s historical ties with western England. Expect musicians, jugglers, and traditional cloggers. Bringing Old World traditions to today’s Santa Barbara wine country, is the annual Solvang Julefest. With authentic Danish-style buildings and windmills for a backdrop, costumed carolers, bands, and equestrians take to the streets for the Julefest Parade. Solvang welcomes holiday shoppers with special events and lots of entertainment. There’s shopping at Solvang merchants of all sorts, such as art shops and galleries; book-sellers; wine tasting rooms; wine and beer bars; clothing, shoes and accessories boutiques; home furniture, décor and hardware; jewelers and antique stops; and restaurants, bakeries and specialty food stores. There’s also a living nativity reenactment. It all comes to a dramatic end with the annual Christmas Tree Burn, a bonfire outside Old Mission Santa Inés in early January. Big Bear Lake, just a couple hours from Los Angeles, offers a classic Christmas escape with holiday lights shining in the village and snow sprinkling on the pines. Christmas to New Year’s, the town transforms into a place of yuletide cheer. On weekends between Thanksgiving and Christmas, let the kids say hi to Santa and Mrs. Claus at the town’s Christmas tree lot. Saturdays before Christmas in December, cruise Big Bear Lake with Santa and gaze at snowcapped peaks during “Sail with Santa” excursions on the Miss Liberty, a paddle wheeler. With its historic gold-mining town in the pine-forested mountains northeast of San Diego, with just a small hint of wintry chill, and the warm glow of fireplaces, it must be Christmastime in Julian. The annual Country Christmas celebration begins on the Saturday after Thanksgiving, with the lighting of the town’s 80-foot-tall living Christmas tree. Merriments continue throughout the season. Julian Tea and Cottage Arts provide delightful Victorian Christmas teas, or visit festively decorated houses on a home tour where you might just find quilts and other locally made crafts for sale.